Posted in Books, Memoir, Products. 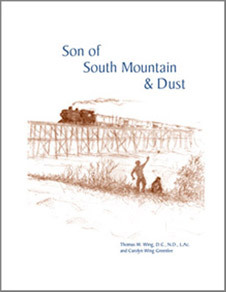 Dr. Thomas Wing’s memoir, Son of South Mountain & Dust offers a rare view inside the head of a Second Generation Chinese boy exploring early ham radio; discovering cars, planes, and trains; and coming to appreciate the weather-beaten Chinese laborers who worked on his father’s farm. Illustrated with the engaging pencil sketches of Duncan Chin, who was himself a rascally little boy.